High Current Relay ISA Card - GT6020 | Marvin Test Solutions, Inc. 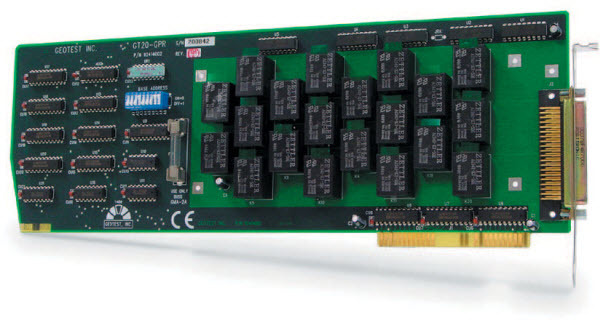 The GT6020 is a 20-channel, high-current relay board that plugs directly into any 8-bit I/O slot of an IBM compatible computer. The GT6020 provides an additional 12 transistor-driven channels for external relays in the form of open-collector transistors providing up to 500 mA of sink current.. These outputs may be used to drive external relays for a total of 32 relay controls per each GT6020 card. A 78 pin D connector provides access to 20 sets of NC (normally closed), CO (common), and NO (normally open) contacts. The GT6020 consists of 20 individual relays and 12 open collector outputs. A 78-pin D connector provides access to 20 sets of NC (normally closed), CO (common), and NO (normally open) contacts. In addition, the GT6020 provides 12 external relay drivers in the form of open-collector transistors providing up to 500 mA of sink current. The board is supplied a 16 and 32-bit DLL driver. Various interface files provide access to the DLL from programming tools and languages such as ATEasy, LabView, C/C++, Microsoft Visual Basic®, Delphi, and more. The available virtual panel can be used to interactively adjust and control the instrument from a window that displays the current instrument settings and measurements.